Chef Philippe Garand with his staff from the Holiday Inn’s Sirocco Restaurant. It’s not only just about the beauty of the view from Holiday Inn Suva to the harbour. It’s also about the service and the food at Holiday Inn. All because one man ensures that his team delivers the best quality food and efficient service on time to guests. 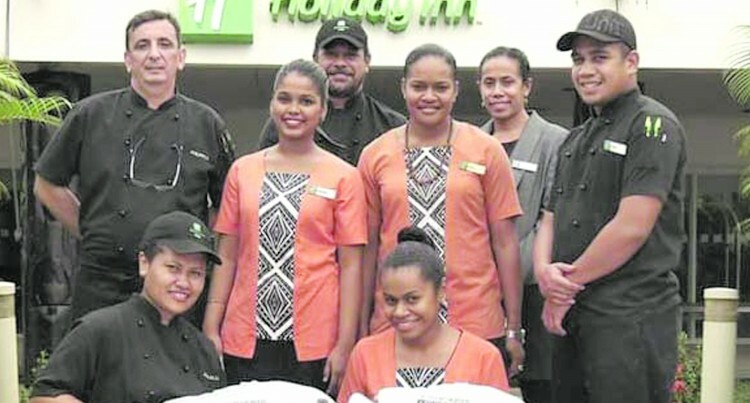 Meet Philippe Garand, the Executive chef at Holiday Inn Suva who has been working at the hotel for the past eight years. “I read a lot; I love to read about food. “Chefs are always curious about new menus. Sirocco Restaurant focuses on Mediterranean cuisine. People can enjoy wood-fired pizza at Bati ni Wai or enjoy drinks, snacks and live music at Tapa Lounge Bar. “We have one dining restaurant called Sirocco (Holiday Inn) and we have our buffet breakfast every morning and lunch buffet followed after. “In this restaurant, I also do special menus for birthdays or other events with a really nice menu based on your budget. He said in terms of their business it’s about coming up with new ideas and to always surprise customers. “I always say ‘You don’t cook what you want; you cook what the customer wants’. He said his source of inspiration is his work experience. “I have worked in many countries and I think it has helped me and I used to go to every market and look at what I can find. A live band plays from Tuesday to Saturday, 6pm to 9pm. “The beauty of the view here is very compact since you will have a very nice atmosphere. He noted that the hotel would soon renovate and upgrade its pool deck. “Our pizza bure will be moved to the seawall. “I am coming up with a new concept of food which will be revealed later. It will be something cheap and fast. “I am planning to have a satellite kitchen in the pizza bure as we only have one kitchen here.